Babies grow so fast. One minute they're a newborn and the next it seems they're graduating from school in a posh prom dress or smart suit! In their first year of life, your baby will do a lot of growing. They'll also do a lot of learning through play - and it's important that the toys your baby is entertained with are interactive and stimulating. Playing with interactive toys engage a little one's hand and eye coordination, introduce them to colors and sounds and teaches them dexterity. You want toys that encourage all of these skills - and the Poppin' Park Elefun Busy Ball Popper from Playskool is just the toy for the job. This toy does more than encourage babies to play - it also encourages them to use their physical abilities, too. Simple yet so engaging, this top Christmas toy works by popping the colourful balsl up and out through the trunk of the elephant. The ball will either roll into the elephant's colorful purple ears, his yellow or green arm and sometimes his yellow basket stomach. The sight and sound of the ball popping up delights the baby and you'll hear squeals of happiness. The ball also gently pops away from the elephant, which thrills babies as they crawl in a high speed carpet chase after the ball. 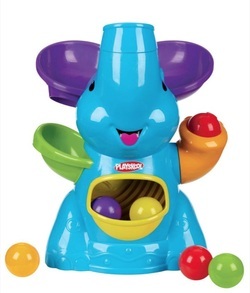 Since babies learn through sound, the Poppin' Park Elefun Busy Ball Popper from Playskool has ten engaging tunes that play for your baby's enjoyment. Babies love not only the sound of the tunes, but enjoy bouncing and clapping their little hands to the music, too. Because the toy is air powered, it will gently pull in the balls through the stomach area and then it will push the balls up and out from the elephant's trunk and the soft pop as the ball comes out makes babies laugh. The toy comes with five balls for baby to have fun with and it's easily activated by a simple touch. When your baby grows older, you can change the way the play is done by turning the trunk. It does take 4 batteries and you'll have to put some of it together. The Poppin' Park Elefun Busy Ball Popper from Playskool is a toy that babies like to play with even if the balls aren't popping up. They like listening to the sounds that the toy has and nothing is cuter than watching a baby delight in music. The base of the elephant is a bright blue, which appeals to baby's love of bright colors - or you can find it in a soft pastel pink.